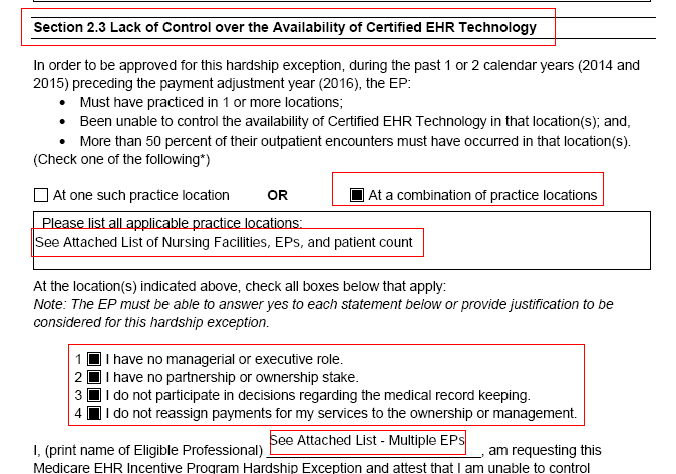 Tips for LTPAC Physicians filing for the 2016 EHR Hardship Exemption – July 1st is your the deadline! LTPAC Physicians – apply for your 2016 EHR Hardship Exemption or suffer an added <2%> pay cut in 2016. In 2014, more than 1,000 LTPAC Physicians successfully applied for the 2015 Medicare EHR Hardship exemption. That exemption was for a single year, if you are unable to demonstrate Meaningful Use in 2015, you’ll want to apply for the 2016 exemption. The penalty for 2014 was a <1%> payment cut in 2015; that penalty increases 1% per year through 2018. Your 2016 penalty will be <2%>. Advanced Practice Nurses and Physicians Assistants are exempt from the penalty through 2018 under current regulations because they weren’t eligible for the Medicare EHR Incentive payments in 2011-14. 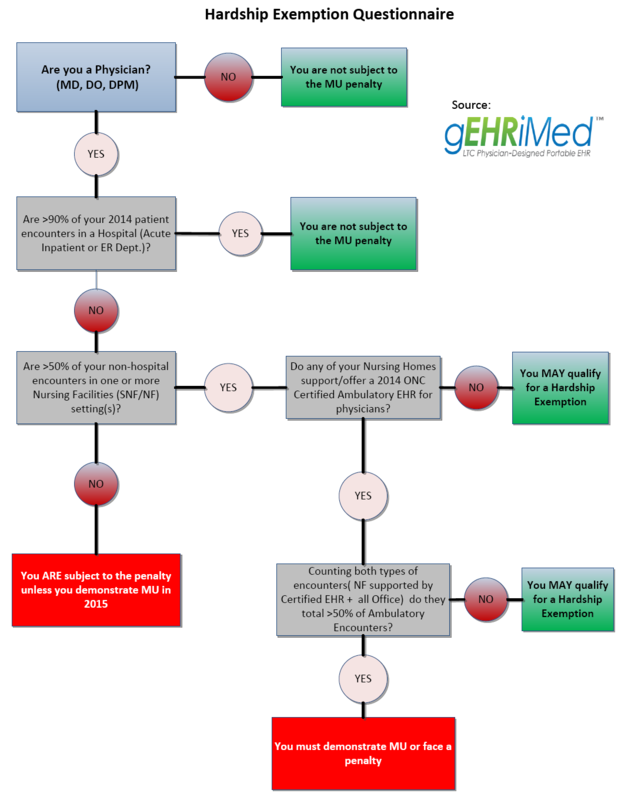 EHR Hardship Exemptions – Are You Eligible? If you are a LTPAC Physician – are you eligible to request an EHR Meaningful Use Hardship Exemption? We’ve created this flow sheet to help guide our own support staff when talking with physicians. None of the CMS information is written from the perspective of a LTPAC Physician so it is complicated to apply the rules as written. Caveat – this flow diagram is designed for use by Physicians working in Nursing Facilities, Hospitals, and Offices. There are other situations/locations which add complexities that are not encompassed in this guidance! PA/LTC physicians will request the exemption under section 2.3 – Lack of control over the availability of Certified EHR Technology. This is our suggestion for how to answer the questions in that section. The form asks for a list of all providers in the TIN that are requesting the exemption – fill that out. Listing Assisted Living Facilities, Adult Care Homes, and Home, patients under the Section 2.3 Exemption is questionable. We believe those locations have no requirements for use of a Medical Record, electronic or otherwise. The Physician is expected to maintain a legal Medical Record as part of their Licensing requirements,lack of CEHRT availability seems disingenuous. If you are in a ‘medical model’ ALF, that does use a LTC EHR, and does supply a ‘medical record’ service, then you would be on safer ground. The provider’s encounter count at each facility (we suggest presenting Q1 2015 as the time period – it is the same methodology used for attesting to Meaningful Use). The providers total encounter count. 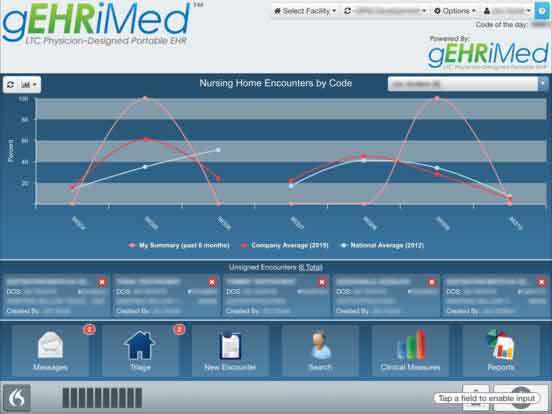 The provider’s % of total patient encounters that were in locations without CEHRT available. All of that information will fit into a single Excel Spreadsheet. Upload that supplemental documentation with a copy of your application. While individual Physician (EP) attestation is no longer required, you are also losing any audit trail that demonstrates that EP authorized the group to execute a hardship exemption request. Since the Meaningful Use program is based on the individual provider, they have to be in control of all MU related actions. You should document that assignment. KEEP COPIES OF 100% OF YOUR WORK. CMS is using Meaningful Use Auditors, and they are not your friends! If you have doubts about the need to do these extra steps, check out some blog posts by our MU consultant – Jim Tate. If you use this hardship exemption (lack of CEHRT availability) thank the AMDA HIT Committee for getting that inserted into the Stage 2 MU Standards, otherwise you would be giving an additional 2% pay rebate to CMS.